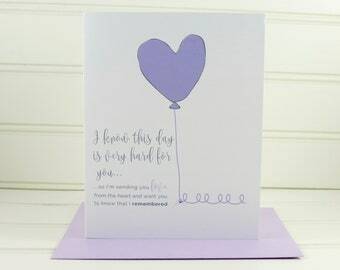 This sympathy card was designed to offer empathy to someone who has suffered the loss of a wife, mother, child, grandmother, sister, aunt, or friend and will be having an anniversary or special date that will bring them additional sadness. This card can be fully customized and personalized at no extra charge and also includes a free matching colored envelope, round envelope seal, and a U.S. Forever postage stamp. 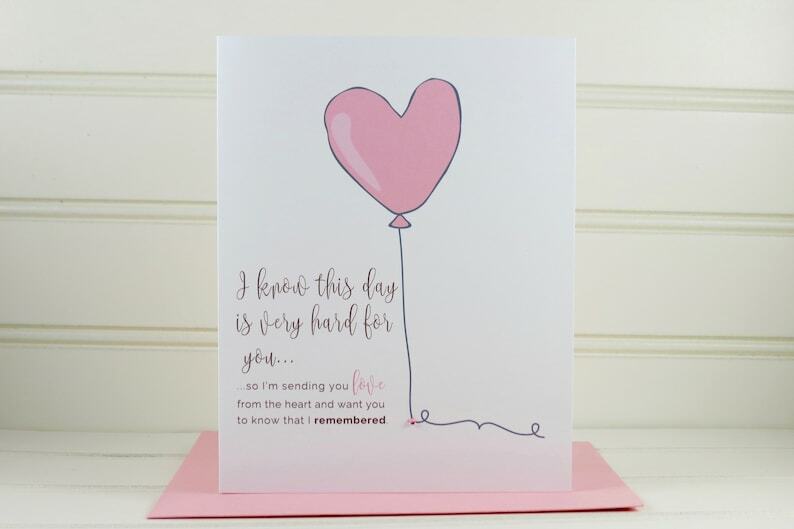 This personalized card has an illustration of a pretty pink balloon and the message, "I know this day is very hard for you...so I'm sending you love from the heart and want you to know that I remembered". The card is blank on the inside and measures 4.25” x 5.5”. Your handcrafted card will be individually printed in my home studio so you can further personalize it by adding any name you wish on the back of the card as shown on the photo. Provide the name(s) you want printed in the Notes section. The card is handcrafted and wrapped individual for protecting the card. I loved that I was able to have my granddaughter name stamp on the back of the card. The card arrive on time. I will be ordering from this again. Absolutely beautiful card that was PERFECT in every way! The card arrived very quickly and in perfect condition. Thank you! All Playa Paper orders must be paid in advance and all Florida orders are subject to Florida State sales tax of 7%. For large custom invitation orders above $300, I will accept a down payment of 50% of the order upfront before I start work on the order, with the remaining 50% paid at the time of order completion prior to shipment. I accept all major credit cards and Paypal for payment. Playa Paper orders cannot be cancelled once an order is placed because all orders are custom designed and printed for each customer. All Playa Paper sales are final. As all Playa Paper products are custom-made for each customer, I am unable to accept returns and offer refunds on my products since they cannot be re-sold to anyone else. However, I want you to be satisfied, so if an issue comes up with your order please contact me so we can work together to find a solution. Thank you. I strive to ship out all Playa Paper orders of greeting cards or invitations on my website within 3 to 5 business days of receiving payment. Custom designed invitation and greeting card orders will take longer to complete. If you need an order by a specific date, please contact me in advance and I can give you an estimated time of order completion. All Playa Paper greeting card and custom invitation orders are shipped from St. Petersburg, Florida. Your card will be packaged and shipped with the utmost care so that you will receive it in perfect condition. We ship all packages via USPS First Class Mail and a Tracking Number will be provided. Shipping rates will be calculated by Etsy at the time of checkout. Upgrades are available to USPS Priority Mail and USPS Express Mail at the time of check out. Please note that if you select Priority Mail, this service normally takes 2 to 3 days for the post office to deliver, but it is not guaranteed by the post office. The only guaranteed service is USPS Express mail. If USPS Tracking says, "Delivered" but your package did not arrive or it is missing, please follow up with the post office or your mail carrier directly as we cannot locate a missing package or offer a refund once it has left our Playa Paper stationery shop and has been delivered to the post office. Insurance is also recommended for your package as I cannot be held responsible if a package is lost in the mail by the post office. Although my shop will list the most popular designs and styles of paper products that I sell, all of my work is custom designed so if you cannot find something you like while browsing my shop, please contact me to discuss your specific needs so I can create something that you will love.